I got to know young Wullie MacFarlane at school. He was a year older than me and I started to visit Wullie at the farm around 1949. His Dad, old Wull and his wife Myrne ran the farm with family help. Myrne's parents also lived in the farmhouse. Arthur Hughes lived opposite the farm in the last downstairs house on Livingstone Street. Wullie, Arthur and I were buddies until the teenage years. The farm was the attraction. What a great playground! But we started helping Wullie with his chores and discovered we were working! Addiewell Farm was mainly a dairy farm and most of the farm work revolved around the cattle and the milking. Milking by hand. I wasn't much at mucking the byre but helped with the evening milking by herding the cows to the byre (they didn't need much help) and feeding the cows with hay after the milking. Two cows to a stall. Walk in between them with the hay bale. Cut the string and retreat. The cows were often playful and would move together as I squeezed between them stopping all progress. Lots of elbow work required. The farm had two Clydesdale horses that were used for the lighter duties around the farm and fields. This was to save petrol for the tractor which did the heavy work such as ploughing, raking and bringing in the corn and hay harvest. Petrol was still rationed, even farming petrol, and had to be used sparingly. The ploughman's cottage had a resident farm helper named Hans and Wullie told me he was a German prisoner of war who had decided not to go home. he spoke english with a strong accent. I remember him as an older man who kept to himself. There were always new chickens in the spring and always pigs in the sty. I'd moved up to the Loganlea prefabs in 1947, 15 Kirkhill Cottages, and in 1950 Wullie asked me if I'd like to help deliver the milk when the milkcart came up to Loganlea. My first job at 10 years old! I worked weekends and school holidays. Catching the milkcart when it came up from Addiebrownhill. Seemed like everybody in Loganlea wanted fresh milk. It was still a genuine milkcart pulled by one of the horses. It was a 4 wheeled flat bed. The only concession to modernity was the rubber tires. The milk was in large metal milk churns with spigots and we delivered to the door in pint cans which we poured into the customer's containers. Some sleepy heads early on a Sunday morning. Winter was the worst with cold milk and cold hands. Even finding some gloves to wear was pointless as they just got wet and cold too. Back at the farm, new health regulations meant that the milk quality was tested regularly by government inspectors. This resulted in a major change in the milking of the cows. 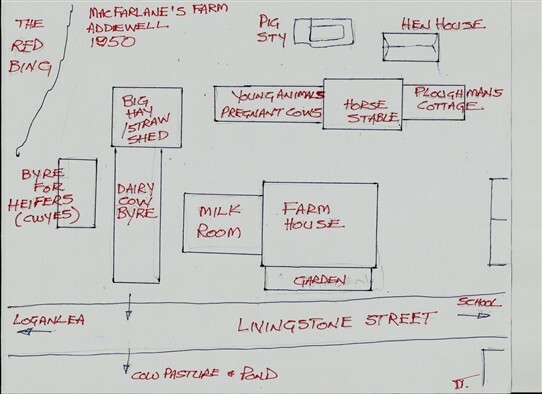 Previously by hand, Old Wull installed an automatic milking machine (de Laval) and a milk room which pasteurised the milk and separated the milk collection from the byre by delivering the milk in a piping system. Now we were into disinfecting the cow's udders before milking and keeping the equipment in sanitary buckets at all times. State of the art! In 1952 I moved back to Faraday Place in Addiewell and started the milk route right at the beginning. 0600 hours. By this time Old Wull had got himself a 1/4 ton Ford van, but the milk was still in the churns and we still had the cold delivery cans. We even delivered to the church manse away down at the White Gates level crossing. Almost into West Calder. Then Livingstone Street, Addiebrownhill and up the Scolley brae to Loganlea. It took about 6 hours to complete the route. Longer on pay days. we looked forward to the payday tips. Money for the Regal in West Calder. But my days were numbered as the milk boy. Wullie's younger brother was big enough now to work the route and Old Wull had installed a bottling machine in the milk room. I was made redundant at 14 years old. But the story of the milk delivery was the story of the farm progress after the war. Government grants allowed for second ,newer tractor. Expansion into potatoes, turnips and kale. And old Wull bought the fields that were opposite my old prefab home in Loganlea. End of petrol rationing meant that the horses were retired. As we moved through West Calder High School, Wullie and I lost touch. I think mainly because Wullie was now a full-time working member of the farm and did'nt have time for recreation. This page was added by David Toynbee on 10/02/2014. What an interesting article - I really enjoyed reading it. It's amazing that cows were still being milked by hand and with so few hygiene regulations as late as the 1940s and 1950s. Did nobody ever get food poisoning? By the way, did you ever come across any remains of the old mansion house of Addiewell that used to stand in the field between the farm and the Breich Water? It was knocked down between about 1820 and 1850. I don't remember anybody getting sick with our milk. We all had much higher resistance common germs back then. No, I've no memory of a ruined big house in that location, north of the farm. We accessed the Breich Water down at the bridge on the Bathgate road, so missed out the fields down from the farm. The old bridge was always there. At a lower level than the new bridge. The roadway across the bridge always seemed solid but there were no parapets left at the edges so we could look down at the river from the side of the road--very carefully! We always called the Breich Water " The Black Burn' because it ran black from all the coal mine effluents upstream. Paddling in the river was impossible because it was full of black mud, coal dust, and it turned our skin and clothes black. Lots of severe motherly lectures if one of us fell in by mistake. Yet, in spite of the pollution there was river wild life with birds and water rats along the banks. We wandered the Briech Water from the Scolley Burn connection to the Drover's Road down at Somerville? Cottages. anyone recall tommy nodwell working at the farm around 1957.